OK people, thank you so much for all your wonderful comments on the holographic butterflies, I got the message that you do want a tutorial loud and clear, so I'll just get right into it. Let me say that this is seriously easy. When you see what it is you will think, "Is that all!" 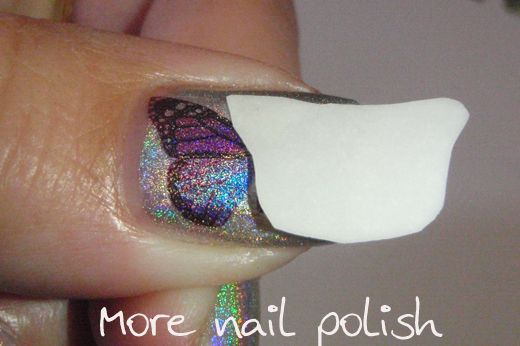 Anyone with a printer will be able to create nails like these, because it really is very simple and quick to do! First up, what is the product? The paper that my designs are printed onto is Temporary Tattoo Paper. I bought mine off eBay. If you search eBay for "Temporary Tattoo Paper" you will find a few suppliers. The supplier I bought mine off has a very good video about how to get your tattoo paper ready. You can check out that video here. But in simple terms, the tattoo paper comes in two sheets. One white sheet with a glossy side that you print your design on, and another sheet which is a piece of white paper with transparent film on the other side. After you've printed on your first piece of paper, you let it dry, and then separate the second piece of transparency from the paper and stick them together. Seriously, watch that video, it only goes for two and half minutes and it shows how to prep your tattoo paper perfectly. So here is my first sheet of designs I did up. As you can see there are lots of different sized and coloured butterflies. I just found a butterfly image on google images and then fiddled with the hue and saturation in Photoshop to get all the different coloured butterflies, but keeping them all a consistent design. There is also some old English names printed (my husband has real tattoos like this with mine and the kids names, and Mr 3 thinks it's really fun to have matching temporary tattoos as dad). You can also see gaps where I have already cut out designs. For this tutorial, I' m just going to do some small butterflies. 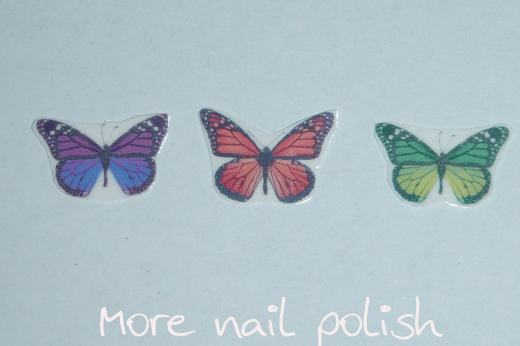 In the last design, I used the large butterflies, cut in half with partial wing designs on each finger, as well as the accent nail which was the collection of little butterflies (despite the fact that the little butterflies look like the Sally Hansen butterflies, they are completely home made). 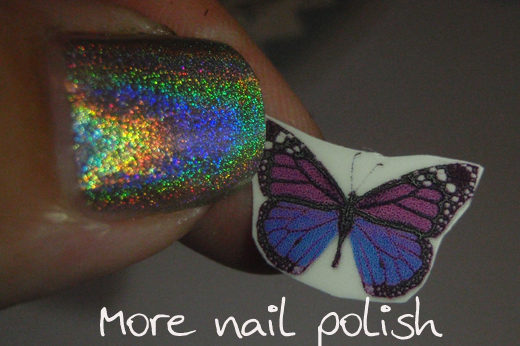 I will be applying the purple butterfly to my thumb, and then applying the red and green butterflies, cut in half on each of the other nails in the video below. So here is the little butterfly that I printed and put together using the temporary tattoo paper. I trim it closely around the design, but it doesn't have to be perfect. Next you peel off the plastic covering to expose the sticky side of the tattoo. Now just stick that image straight onto your nail. Make sure you place it correctly, because you wont be able to move it around like a water decal. It is just like sticking down a sticker. Press it firmly and rub it outwards gently to ensure there are no creases. Grab a cotton ball or wipe and dip it in some water. Hold the water against the nail for 10-20 seconds. The piece of paper will now just slide off. And now your design has been transferred. You can clean up any parts of the tattoo that overhang your nail edge or at your cuticle with a bit of polish remover (or trim with scissors). Then put on some top coat and you're done. The tattoo, once it is applied and no longer has paper on either side, is actually very stretchy. 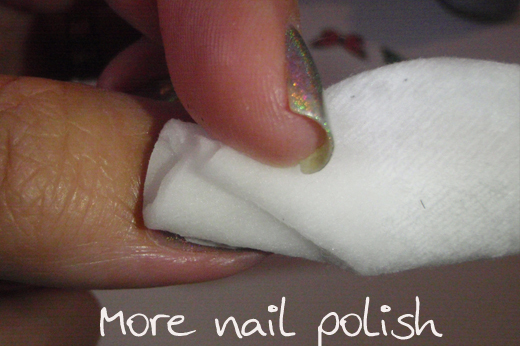 This means that it can be easily smoothed onto the nail and it doesn't form any creases. That is the problem that I have with water decals. Water decals are great for small images, but these temporary tattoos are perfect for all over nail designs. Now I did record this rather dreadful video. I've said it before, but I have no clue about editing videos to make them fancy, so this is just a direct download of what I recorded from my camera. Apologies for the moments where I forgot about the camera and my fingers disappear from the screen, and also for the odd clicking noises. It's only a short video and I do four nails, so you will see how quickly this can be done. Here is a photo of the final look. 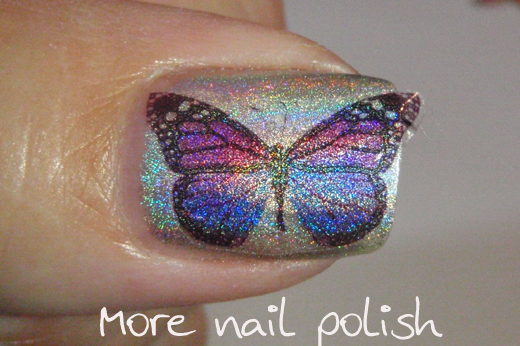 The only difference here from my original mani is that I did a smaller butterfly design on my nail. I think the full design covering the whole nail looks better, but I wanted to show another option. Unfortunately there was no sun today, so these photos are under the bathroom light, which doesn't show the holo off as well., but you get the idea. I found these lasted on the nail really well. As you can see in the video, I still have the original design on my right hand. I have plenty of tip wear, but I actually found that where the tattoo was on my nail it made the holo polish last much longer. When I was removing the polish off my left hand prior to doing this tutorial, I found that the design actually seemed like it wasn't coming off. I rubbed and rubbed and it didn't do anything except remove the polish from the nail where the tattoo didn't cover it. I found that it was much easier to pick at a corner of the tattoo and peel it off in one sheet, then remove the polish off the nail. Now I'm sure you will agree, these are super dooper easy to do. 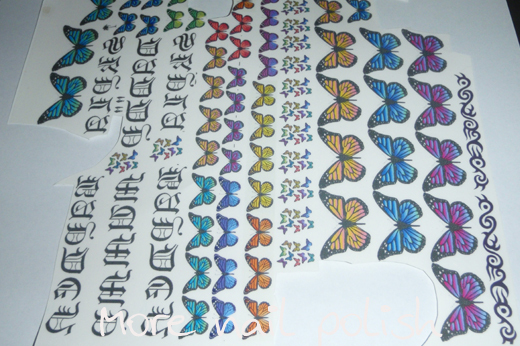 Let me know if you get any temporary tattoo paper and give this a go! I'd love to see what people come up with. I knew about the idea of making your-own-nail-sticker using tattoo paper but didn't know it works soooooooooooooo great as this on the holos!! Oh god I might try this, I definitely might try this!! Thank you VERY much for this fabulous idea & post!!!!! OMG That is fabulous! Thank you for sharing! this is such an awesome tutorial, thanks heaps! I can't wait to try this out! Think so much for the awesome tutorial! so beautifull! i'd rather small butterflies! Holy Crap that's awesome!!! I wonder if this would work with any fake tattoo you buy at the store. I will so have to try this! 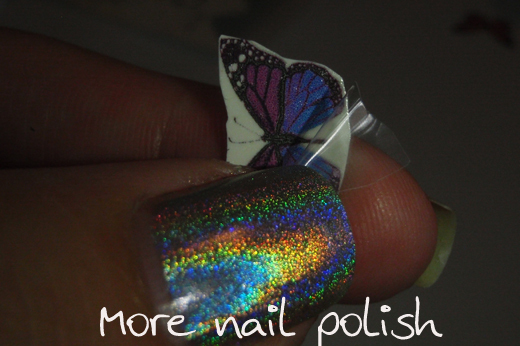 Yes it does, I tired it with a cheap packet of butterfly temp tattoos I had and it worked perfectly. That's why I started looking for a DIY version so I could make my own design. Thanks so much for posting this tutorial - think I might give it a go one day! Oh wow, I didn't even know you could get temp tattoo paper!! My daughters would love some to match mine & husbands!! ANd this manicure tutorial is perfect, thankyou! Thanks so much - had no idea anything like this paper existed. 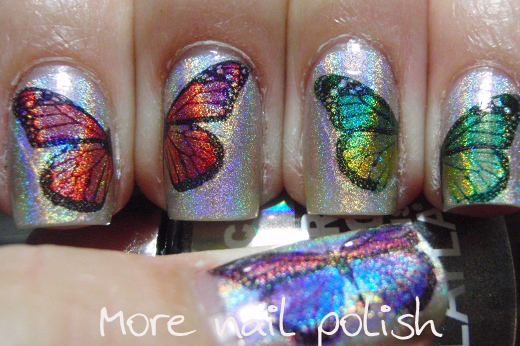 So...the Holo we see in the butterfly is really coming through the sticker from the base polish and not the sticker right? Yep, just the holo from Layla Mercury Twilight, the tattoo sticker stuff is very think and clear, so it doesn't effect the holo finish very much. Wow! What a great idea, thank you for sharing. Could you possible post a link to the page on eBay you ordered from? I'm afraid of buying the wrong ones! Pleeassseeeeee =] And I love the tutorial I wanna try it soooo bad!!!! The supplier I purchased from only ships to Australia, but here is the ones I got. I had no idea it would actually be this easy! Very clever (: I hope I can get my hands on that paper and give this a try. I love it soooo much! cutepolish just put up a tutorial video for the same thing. I'm not saying she stole your idea, but putting up a video the day after you posted yours and saying "i was at the store last week and i saw these temporary tattoos. it got me thinking" seems kind of shady. Just thought you might want to know in case you wanted credit. 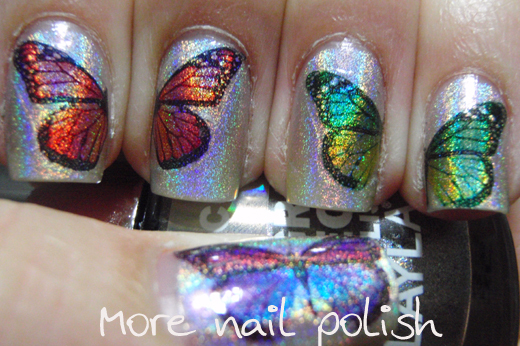 Cathy - you should try doing just a straight rainbow gradient over the holo polish..... then you get real rainbows!!! I actually just printed a new sheet of tattoo paper and it has two sorts of gradients rainbows, I literally just put one one now!! Must you use a laser printer, or can I use an inkjet printer too? The tattoo paper I got was specifically for an inkjet printer. Mine were all inkjet and done on at cheap printer! I absolutely LOVVVE this idea!! So original and clever!! I will have to try this sometime. I love this so much! Im going to have to try it! Are there specific papers for laser and inkjet printers? THANK YOU so much for this tutorial--you ROCK!! Thanks for this excellent tutorial. I look forward to trying it. 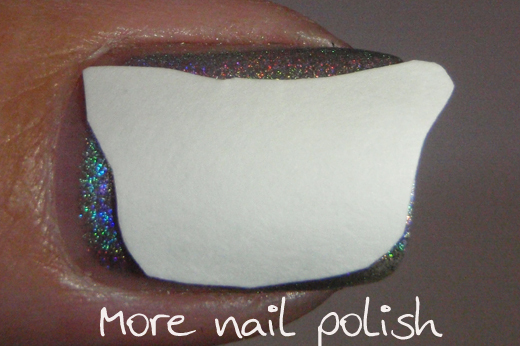 I can't afford any of that beautiful holo polish so I was wondering if you tried this method with regular polish. Printable tattoo paper? That is frickin AMAZING. I want some. I love your original design by the way! This is SOOOOOO amazing! Well done! what kind of format picture did you use? JPG or PNG? Lynnderella - Happy Holo Daze!